Last week most European national football teams played a number of friendly international games as part of their preparations for the 2016 UEFA European Championship in France. One game in particularly within this cycle stood out from the rest. During the game between Croatia and Israel, the home crowd engaged in continuous chanting of “Za dom spremni” (For the homeland ready), the official salute of the Independent State of Croatia, a fascist WWII quisling-state. 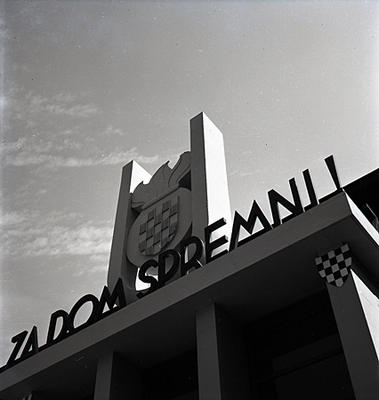 The chanting of Za dom-Spremni has become an integral part of an infamous and ritualised fan ‘culture’ at games of Croatian national teams in various sports over the last 20 years. It has attracted significant of public interest and debate, but has been widely neglected in academic research. We are delighted to present recently published research by Dario Brentin, a University Assistant the Centre for Southeast European Studies at the University of Graz and PhD Student at the School of Slavonic and East European Studies at the University College London and member of The Football Collective. Dario’s article reflects upon the ritualised usage of the fascist chant in Croatian football fan culture and in doing so reflects on its complex symbolic and contentious meaning in contemporary Croatia. In the case of Croatia, sport has proved to be a highly politicized form of national expression, functioning as a salient social field in which its “national habitus codes” are most intensively articulated, debated, and contested. An incident emblematising this argument occurred on 19 November 2013, when the Croatian national football team secured their qualification for the 2014 Football World Cup in Brazil. In front of the 25,000 people at Zagreb’s Maksimir stadium, the national team player, Josip Šimunić, grabbed the microphone and “greeted” all four stands with a loud chanting of Za dom, to which the stands thunderously responded spremni, the official salute of the Independent State of Croatia. This paper argues that the issue extends beyond politically radicalised football hooligans and has to be understood from the standpoint of “social memory.” By focusing on football, the article scrutinizes debates in the Croatian public sphere dealing with the salute Za dom – spremni. Providing an insight into its complex and multi-layered nature, this paper illustrates that Croatian football has to be understood as a field in which social memory is prominently constructed, heatedly articulated, and powerfully disseminated. To read this article click here and to contact the author email: dario.brentin@uni-graz.at or to link up on Twitter @DarioBrentin. You will also find more about the author here on his University profile and his other research on Academia.edu. Brentin, D. (2016) Ready for the homeland? Ritual, remembrance, and political extremism in Croatian football. Nationalities Papers. Epub ahead of print 16 March. DOI: 10.1080/00905992.2015.1136996. Available here.